The La Sportiva Shadow is rated with a 125 flex, which I would say is a true rating. 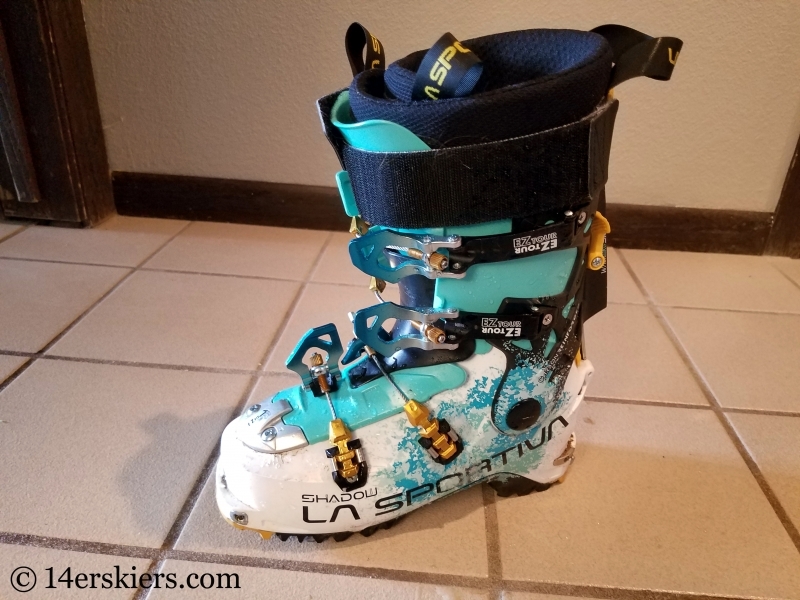 This boot is among some of the stiffest I have ever tried in the backcountry models and is very comparable to a stiff resort boot. The forward lean is set at 14 degrees, but an adjustment setting in the back allows the angle to be changed from 12 degrees to 16 degrees. I played around with this setting and found it a bit difficult to adjust. The La Sportiva Shadow is designed as a two-piece tongue-style boot. The smaller black piece is designed to fit into grooves that match up with the larger blue tongue. The first is the obvious groove viewed from the front of the boot.  This improves forward stiffness. But, if you pull up the black part of the tongue, you can see that it also fits into a small groove in the blue tongue, which helps to improve lateral stiffness of the boot. Those wishing for less forward stiffness can remove the black tongue with an allen wrench, or take out the blue tongue altogether – although I found removing this tongue to be quite tricky. 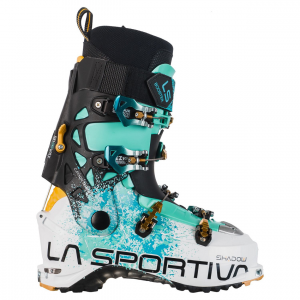 The La Sportiva Shadow is equipped with a tech-fit system that is compatible with most touring bindings. A simple switch allows you to switch from touring to ski mode and back. 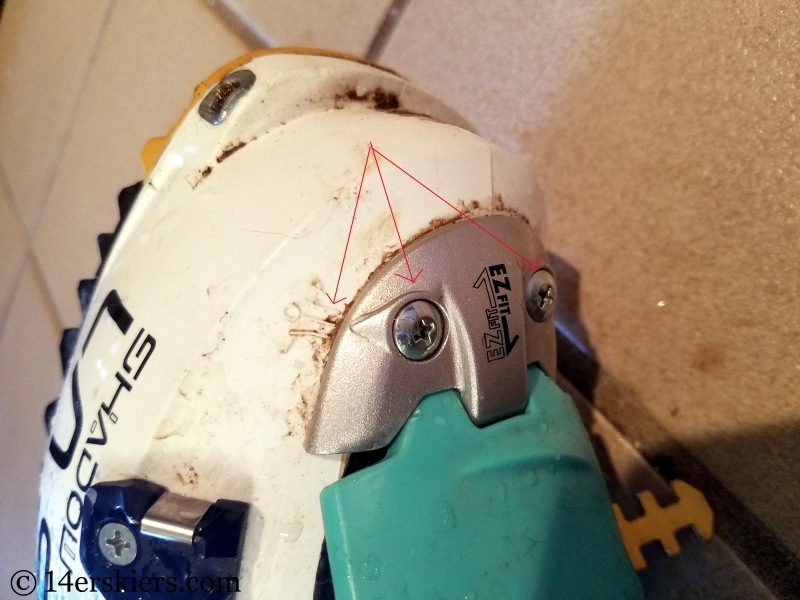 Of course, when going into ski mode, you will want to make sure that the black part of the tongue is properly lined up to fit in the proper grooves with the blue tongue. One of the highlights of the La Sportiva Shadow are the Pegasus Plus buckles. 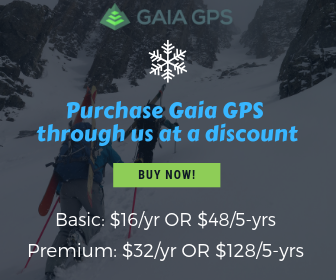 These buckles are designed to allow for an easy switch from tour mode to ski mode and back. You can tour with the buckles open, but the buckles stay in their hinged position on the boot instead of flopping around like many other models. 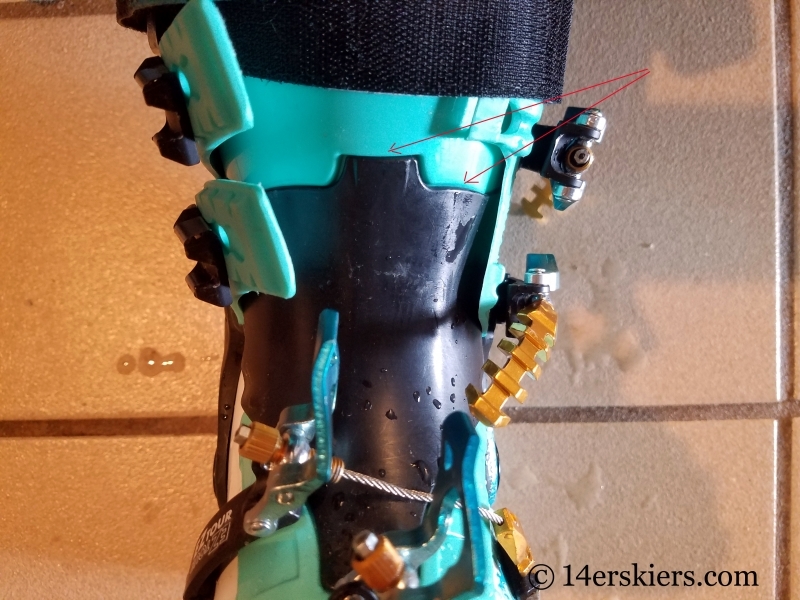 When it comes time to ski again, your buckles should already be in your desired hinge position, so rather than mess around with getting them into proper placement, all you need to do is put the buckles in locked buckle position. 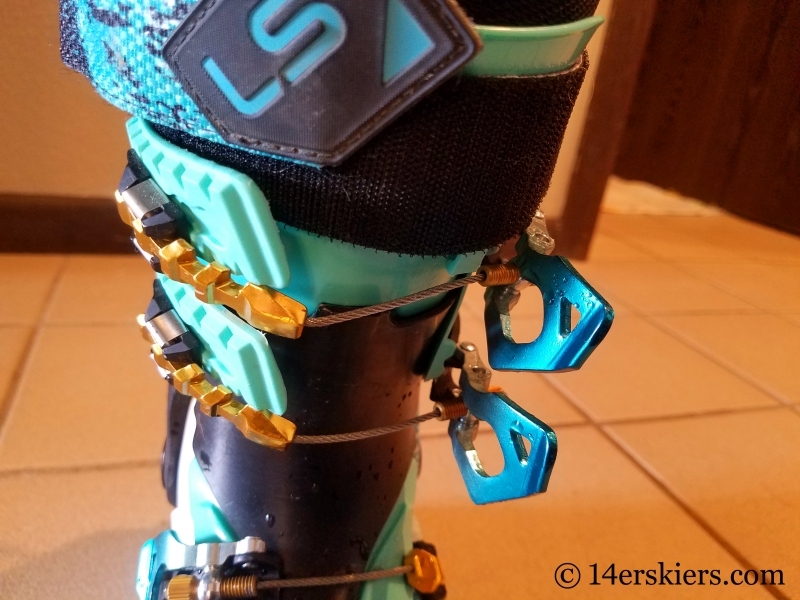 While these buckles are a little finicky to get locked into place at the start of the day, hopefully this is the only time you need to mess with their positioning as they should remain in place for the rest of the day, from tour to ski mode and back. 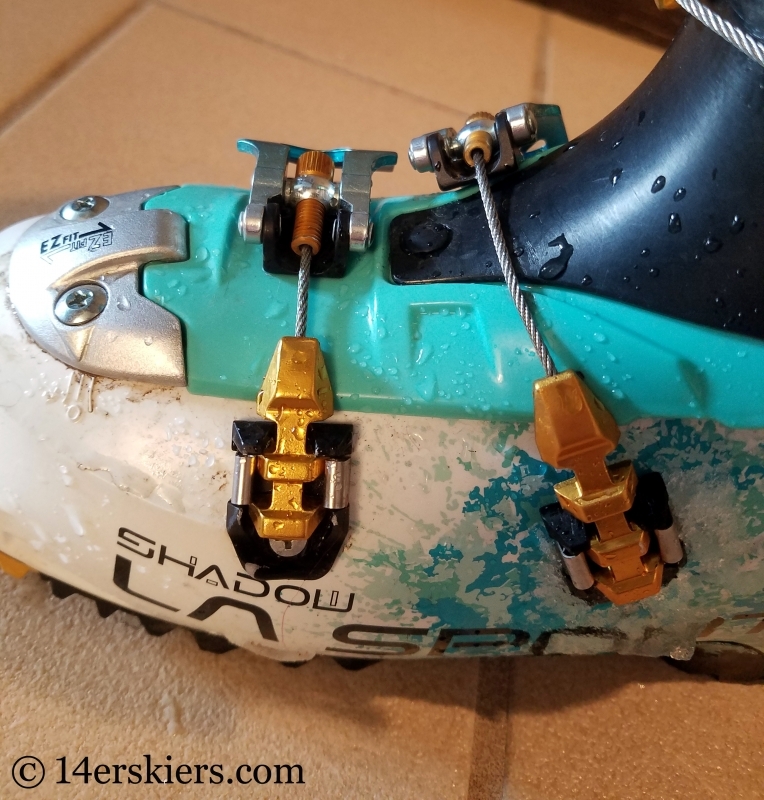 The buckles on the La Sportiva Shadow are micro-adjustable and the two upper buckles can be repositioned in the shell to account for narrower calves. 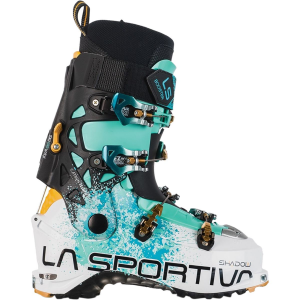 La Sportiva boasts a 50 degrees range of motion when the boot is in touring mode. I did not test this rating myself, but I did find the range of motion to be adequate. Of course, range of motion is improved with looser settings on the buckles. A spoiler in the back of the boot improves stiffness, but can be removed for those wanting a bit more range of motion while touring. For times when you need to take your skis off and travel by foot, the Vibram sole provides great traction on slippery surfaces. Aside from the forward lean adjustment mentioned above, the La Sportiva Shadow comes with many other features designed to help improve fit. The wrap-style liner is fully moldable, and is very much like an Intuition liner. If you find that the tongue is putting pressure on one side of your shin but not the other, you can also adjust the sideways position of the tongue. The last is rated as a 102.5. While I lean toward a wider last, I would say this last is a bit narrower than the claimed 102.5. Still, there was adequate room in the Shadow for my wide toes. I typically ski in a size 23 boot and the Shadow sizing seems pretty accurate. 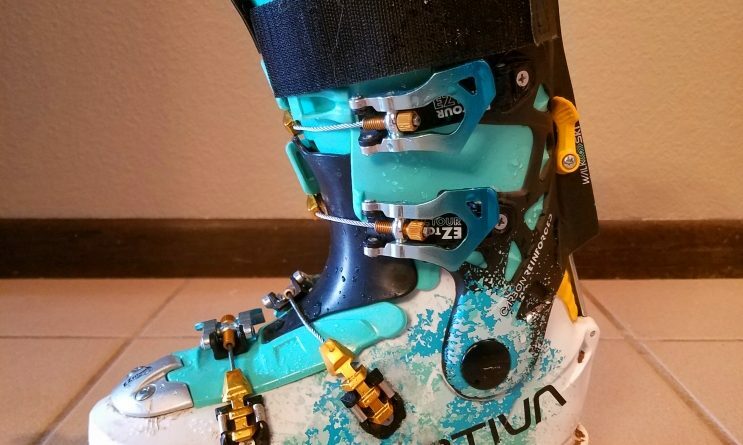 La Sportiva put a lot of really thoughtful design features into the Shadow and Synchro freeride backcountry ski boots. While many of these features are great, they can be a little finicky when really put to the test. As previously mentioned, the Pegasus Plus buckles are a little difficult to get into their original position. But, the design really does allow them to stay in proper position when unlocked for touring mode. The other thing you may notice is that the upper two buckles don’t seem to stay lined up with their intended position on the shell – both in touring (buckles undone) or ski mode (buckles locked). I think this part of the shell needs to be resigned so that the buckles line up in the correct spot. Also, I’d like to challenge La Sportiva to come up with a buckle system whose buckles remain in hinged position while touring, but is a little less finicky to actually buckle. Additionally, I would like to see the forward lean setting be a bit easier to adjust. 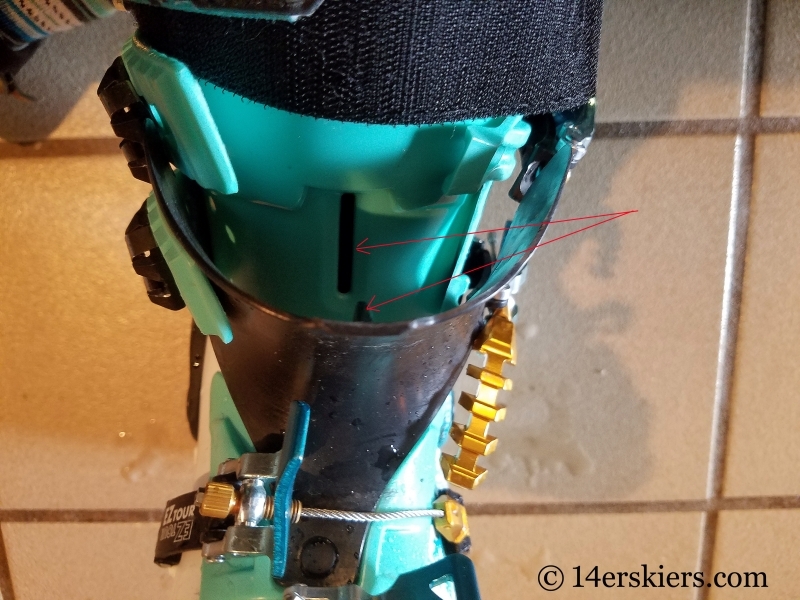 And last, I found that there was a lot of extra space on the inside curve of the boot, near the top of the foot and lower part of the ankle. This extra space compromised performance on the descent at times. Overall, the performance of the La Sportiva Shadow was better than I even expected. 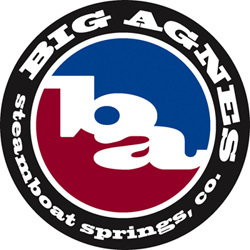 You’d be hard-pressed to find a women’s boot stiffer than this designed for backcountry skiing. Skiing in these boots was always easy! In many days of touring, I never had a malfunctioning part. While I think La Sportiva put some excellent innovations into this boot which help improve it’s overall performance, some of these innovations come with their share of finickiness. I like this boot, and I will continue skiing in it. 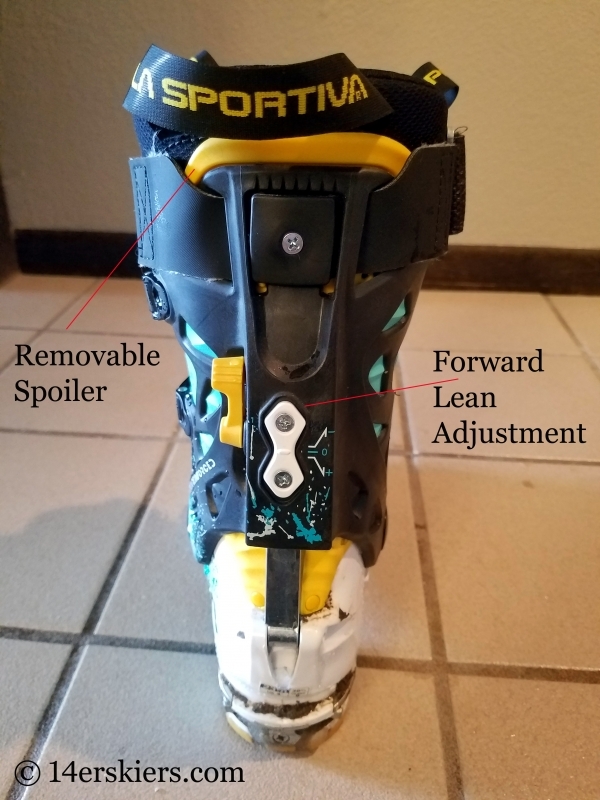 But, I am hoping La Sportiva does some design improvements for the next generation of this high-performance backcountry ski boot! 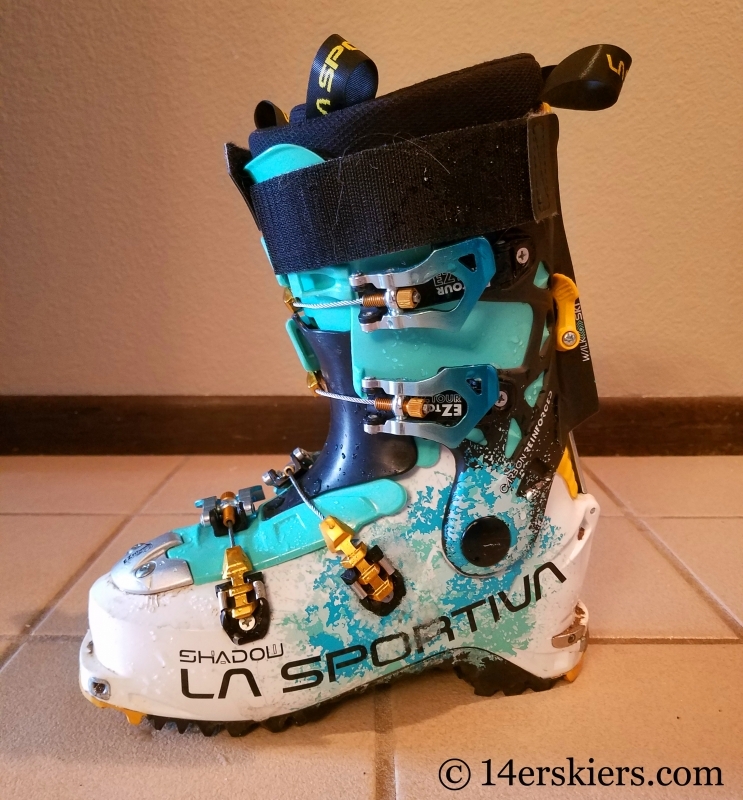 Brittany reviews the performance, fit, and functionality of the La Sportiva Shadow, a stiff women's freeride backcountry ski touring boot!